Optional practical training (OPT) is defined as "temporary employment for practical training directly related to the student's major area of study," and has a duration of up to 12 Months per each degree level (Bachelor’s, Master’s and Doctoral). An F-1 student must have been "lawfully enrolled on a full-time basis in a Service-approved college, university, conservatory, or seminary for one full academic year" to be eligible for CPT or OPT. Work done for OPT must be "directly related to the student's major area of study." The ISO has developed a comprehensive guide on the OPT eligibility and application process. Once you have read the above guide, please follow the below instructions to begin your online OPT application. 1. Visit the ISOGateway at https://isogateway.gwu.edu. 2. Look for the box titled "Full Client Services for Students & Scholars" and click the blue Login button. *Note: Your GW NetID is the first part of your GW email address before the @ sign. Example: If your GW email is [email protected], then your NetID is GWashington. 4. 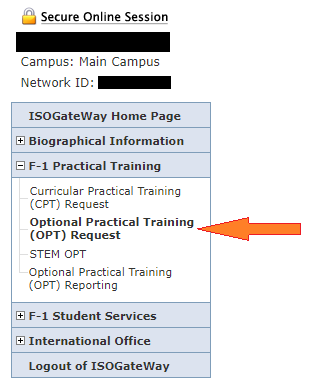 On the left hand menu, choose F-1 Practical Training, then Optional Practical Training (OPT) Request. 5. Complete the Optional Practical Training (OPT) Request E-Form by answering all required fields which are marked with an asterisk (*). 6. 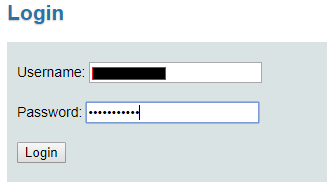 Click on the Submit button located at the bottom of the E-Form when done. It is possible to travel on OPT. However, you should consider the impact your OPT application will have on the likelihood that you will be re-admitted to the US. There is always a risk when re-entering the US that you will not be permitted to enter, however on OPT these risks can be minimized if you travel with all of the recommended documentation and at certain times during the OPT application process. 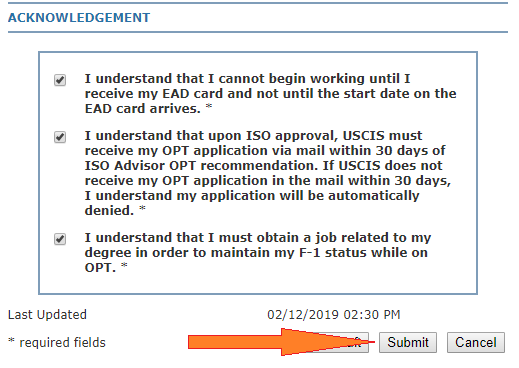 The least risky time to travel is before your I-20 expires, regardless of whether you have applied for post-completion OPT or not OR after your I-20 has expired, but you have your Employment Authorization Document (EAD) card and a job which you have already begun working in. Any time in between these two milestones in the OPT application process carry with them an increased risk of being denied re-entry. You should direct these questions to an ISO advisor. The ISO offers several OPT workshops per year. For more information on upcoming workshops, see the Programming and Events page.